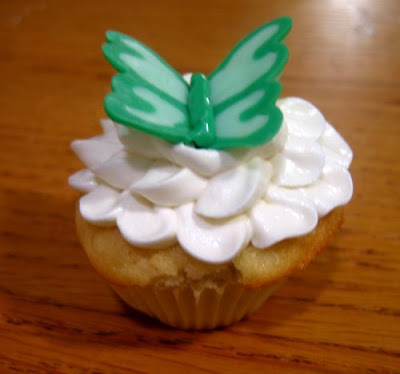 One miniature butterfly cupcake is pretty cute. 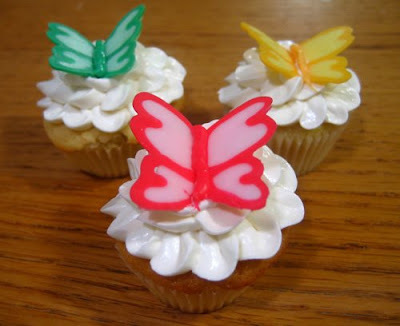 Three mini butterfly cupcakes are kind of darling. 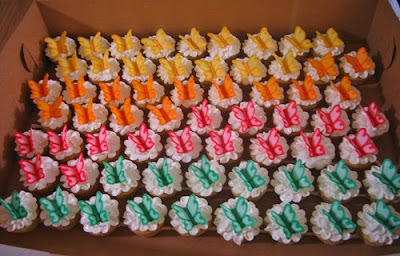 But a huge spread of dozens and dozens of mini butterfly cupcakes, arranged wing to wing? UNBEARABLY ADORABLE. This, my friends, is the Tijuana Turtle Effect. As she explains it, it's like when you go to Tijuana and see these stalls selling hundreds of small bobble-headed turtle figurines. The sheer volume of the teensy turtles hypnotizes you into thinking they're just the cutest things you've ever seen, and pretty soon you won't be happy until you own a Tijuana turtle for yourself. Of course, you get home and it's not nearly as cute without its brethren--but that is the lesson of the Tijuana turtles. We've found this also holds true for all types of miniature desserts. No matter how cute something looks, it invariably looks twelve times cuter when surrounded by hundreds of clones. 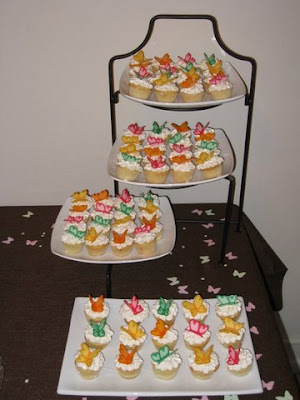 I made these butterfly cupcakes for my friend Heather's baby shower. 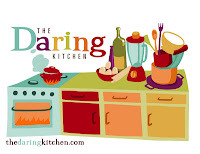 Citrus flavors are her favorite, so I did lemon cupcakes with four different flavors of citrus curd inside. The green ones are key lime, the pink are pink grapefruit, the yellow are lemon, and the orange are (you guessed it) orange. 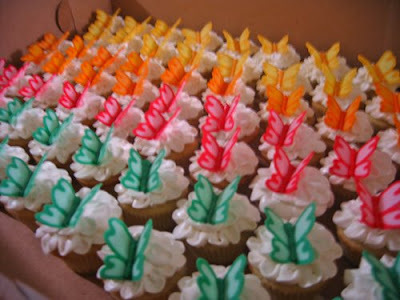 Each is topped with vanilla buttercream and a white chocolate butterfly. So the next time you're not so pleased with the appearance a dessert you've made, simply make a few dozen more and arrange them side by side. I guarantee they will look way cuter, and if you're still not pleased, you now have a ton of dessert with which to comfort yourself. Win-win! I think your boss is a genius. She should totally get the rights to "Tijuana Turtle." Such a true phenomenon! So, I'm sure you can guess that my reaction to these miniature cupcakes was "Oh man, these are too cute!" But, seriously, not only are they cute, they sound so delicious! Love all the different curds going on. These are stunning, Liz! I am amazed by the amount of effort and detailed piping they must have required. Tijuana Turtle Effect is so true! How many times have I bought the perfect little trinket on vacation and gotten it home and wondered what I was thinking. It was TTE! TTE is so right on! These are too cute and what great variety in curd! Sounds fantastic. So cute and they sound really good! Yes! But I bought 10 turtles! In Zihuatanejo not TJ. But yes they are so darn cute. You're right--they look awesome, especially the whole gaggle of them. Gaggle is for geese, is it flock of butterflies, oh no matter, love the whole Tijuana turtle concept. And I love all the flavors! So it's not just the way they look...they also taste better when you eat several at a time! 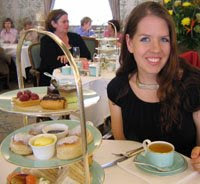 Oh, man, Elizabeth - they were so adorable and so delicious. You're the master of that combo. Thanks a bunch! could i possibly have the way to make the adorable butterflies too??? i love butterflies and these are just stunning and whimsical!! Your miniature turtle cupcake in the first picture is to die for! I tried to make a batch that looked similar and failed miserable but at least they tasted good. I love your cupcakes and that you went to so much effort for your friends baby shower. 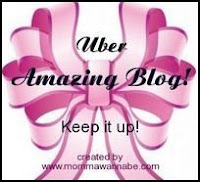 I stumbled across your page by accident when I was googling pictures of cupcakes and was memorized! Not only do I know want to eat a cupcake but I want to go to Tijuana!!! Tijuana dentist industry is mixed up with different types of dentist with several types of quality. I was really very confused about what should I do with my teeth that I lost because of my carelessness. Then Smile Tijuana solved my problem and now I am very much fine. There are many Tijuana Dentista, so I got confused with them. Luckily, I went to the Smile Tijuana and I solved my problem there. They provide the warm service to me. While I was trying to sort out one dental implants Tijuana, then Smile Tijuana gave one great solution to me. They solved the problem in my mouth and I got my confidence back. The main success you can get from here is the way to find the right manner here. No TWD; Instead, Dessert Smorgasborg!